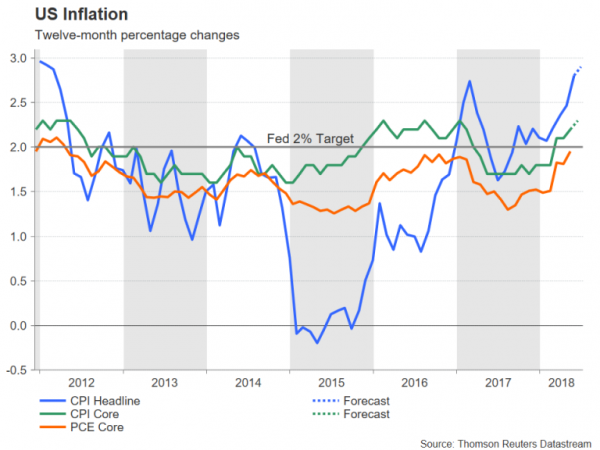 Consumer prices in the United States are expected to rise at the fastest pace in nearly 6½ years in June, maintaining the steady recovery in prices after a brief spell of deflation in 2015. After yet another muted wage growth figure in June, investors will be watching the CPI release on Thursday at 12:30 GMT for possible signs of an acceleration in consumer price inflation. While the Federal Reserve would likely overlook any temporary spike in inflation, the dollar could still see some reaction to the data as markets are undecided whether the Fed will raise interest rates once or twice more this year. The 12-month rate of CPI jumped to 2.8% in May and is expected to inch up to 2.9% in June to levels last seen in early 2012. The core rate of CPI, which excludes food and energy prices, is forecast to rise from 2.2% to 2.3%. Increases in the price of fuel from the rise in oil prices have been driving the headline rate higher in recent months. However, core inflation, while lower, has also crept higher (from a 2017 low of 1.7% in November), and so have producer prices. PPI for final demand rose to 3.4% year-on-year in June – the highest since 2011 and above expectations of 3.2% – according to data released today from the US Bureau of Labor Statistics ahead of tomorrow’s CPI report. The biggest risk from rising inflation is the squeeze on real incomes as US wage growth has been hovering between 2.5%-3.0% over the past few months, unable to break above 3.0% despite a continued tightening in the labour market. A drop in real incomes would be negative for consumer spending and could potentially offset the effects from the tax cuts. This unwelcome scenario is the reason why the President Donald Trump has been so vocal at calling on OPEC to pump more oil and reduce crude prices. 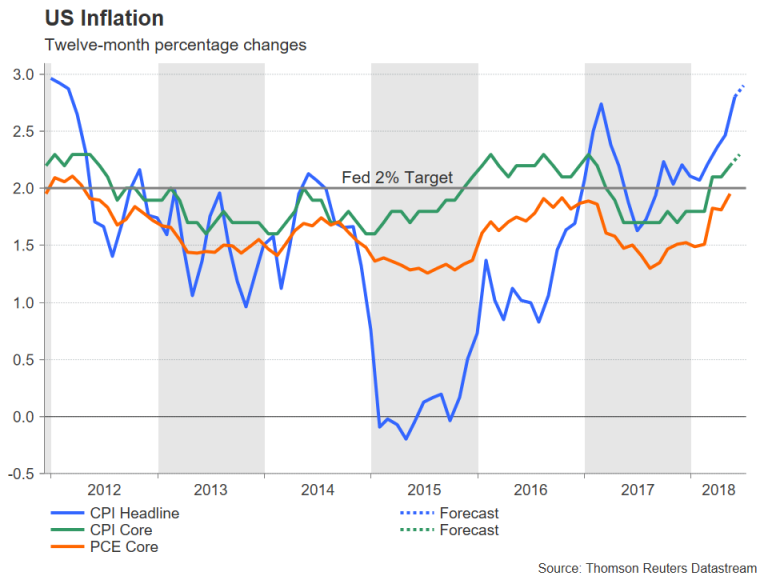 But with wages remaining subdued and the Fed’s preferred inflation gauge, the core PCE price index only just hitting the 2% price target, the US central bank is not expected to see any immediate threat from the pick up in the consumer price index. That’s not to say the CPI figures won’t attract interest from dollar traders, as investors have yet to fully price in the probability of a fourth rate hike this year. So any surprise in the data to the upside would push up the odds closer to 100% and boost the greenback. A stronger-than-expected set of CPI numbers could help the dollar break immediate resistance at around the 111.35 level versus the yen. This area proved a strong upside barrier in May and is once again acting as resistance. Clearing this hurdle would open the way for the 112 handle, while a stronger rally would take the focus on the December 12 top of 113.74 yen. However, if the inflation figures fall short of estimates, the dollar could face a fresh sell-off on reduced expectations of a fourth rate hike this year. The greenback would likely seek support from the 111-110.80 region in such an event. Further down, the next support should come from the 110.20-yen area, which is the 61.8% Fibonacci retracement of the downleg from 113.74 to 104.55. Sharper losses could pull prices towards the 50% Fibonacci just the above the psychological 109-yen level.